Plant taxonomy classifies gerbera daisy flowers as Gerbera jamesonii, although the plants that you buy at a garden center are most likely hybrids. "Transvaal" or "African" daisy are listed as common names for this plant since it is native to South Africa. But in North America, you are more likely to see an altered version of the scientific name (either "gerber daisy" or "gerbera daisy") used essentially as the plant's common name. Gerbera daisy flowers are classified as herbaceous perennials, even though they are treated in cold climates as if they were annuals. They are members of the aster family. Gerbera daisy flowers typically reach a little over one foot in height (with a width slightly less than that), although some types may grow bigger than that. Flower stems and leaves have a soft feel and appearance, due to the presence of numerous, tiny hairs. The dark-green leaves can reach 20 inches in length. While the foliage is nice, it is for the colors offered by the flowers (which bloom all summer long) that gardeners grow this plant. Gerbera daisy flowers are grown as perennials in planting zones 9 to 11. Elsewhere, they are treated as annual plants. In zone 8, some homeowners report success in growing them as perennials, especially if garden mulch is used to furnish them with some protection from the cold in winter. However, be sure not to allow mulch to cover the crown since this plant is susceptible to crown rot (see below). Grow gerbera daisy flowers in full sun to partial shade. Full sun is preferable in the North, while, in South, it is often better to locate these perennials in partial shade. Grow them in a well-drained soil enriched with compost. A sandy soil is ideal for these lovers of sharp drainage. Their moisture needs are just average once they become settled, but make sure transplants get plenty of water. In the South, gerbera daisy flowers are popular in perennial beds. A good companion plant for them is purple ice plant (Delosperma cooperi). The fine plant texture of the latter contrasts well with the coarser texture of gerbera daisy's leaves. Northern gardeners sometimes treat them as annuals and take advantage of the bright colors of these tropical plants to accent garden beds populated chiefly by less-expensive annual flowers (gerbera daisy being a rather pricey plant). However, a more popular use in the North is as holiday plants, to be given as gifts and kept as (short-lived) houseplants. They are also used as cut flowers. Whether you grow them inside or outside, rest assured that they are safe plants to grow around pets, being poisonous neither to dogs nor to cats. Because of the showy colors, they come in, they are also great choices to use in containers to dress up your patio or deck. 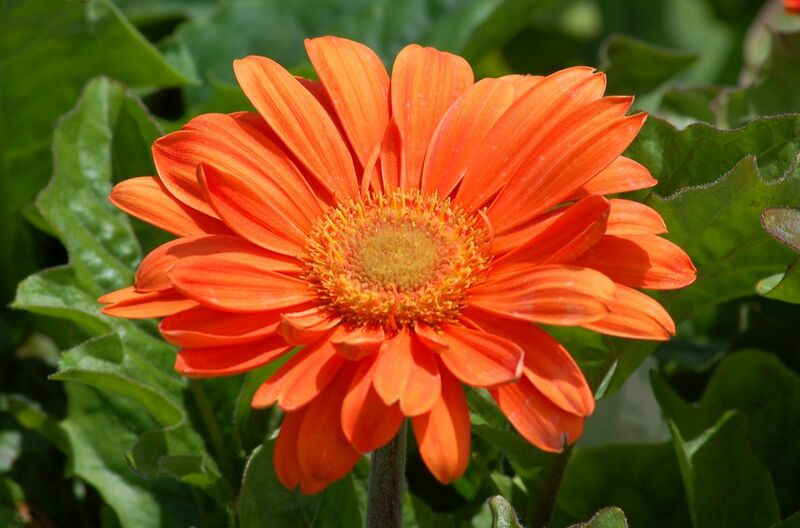 Gerbera daisy flowers will bloom for 4 to 6 weeks as houseplants with proper care. Put them in a sunny window. Water them when the soil at the root level is dry, but do not overwater. Avoid overhead watering and watch out for any insect pests that may appear on the plants. Potted plants bought at the florist should be introduced only gradually to direct sunlight outdoors; otherwise, they will wilt. In fact, you should get into the habit of hardening off plants that are being moved around like this, generally speaking. Gardeners growing them as perennials will want to transplant any plants with sunken crowns in spring to ward off crown rot. If you will be growing the plants from seed, sow the seeds inside about 12 weeks before the final frost date in your area because the plants are slow growers. The peat pots commonly sold at garden centers for starting plants from seed are ideal since gerbera daisies are fussy about being transplanted. Once all risk of frost has passed, you can bring the seedlings outside. Whether you are growing gerbera daisies as perennials or as annuals, as houseplants or as landscape plants, a key to their proper care is getting the watering right. Water them faithfully to get them started, but, thereafter, beware overwatering. All things considered, there is probably a greater chance of killing them by overwatering than by underwatering. The idea is to have an evenly moist (but not soggy) soil at the level of their roots. Fertilize regularly with an all-purpose fertilizer for the best blooming display. They are susceptible to crown rot, so do not plant them too deeply. They also have problems with powdery mildew, which is why you need to avoid overhead watering. You should also water the plants early in the day, giving the leaves a chance to dry out as rapidly as possible (before night falls), thereby discouraging fungal invasions. Checking the leaves once in a while for bugs should be part of a regular care regimen. If you find an infestation, spray with neem oil. Possible pest problems may come from whitefly, aphids, spider mites, and other small bugs. Deadhead the blooms to promote additional flowering. The genus name, Gerbera comes from the name of an 18th-century German naturalist, Traugott Gerber. This name origin will come as quite a disappointment to those who fancy that gerbera daisy flowers are in some way connected with Gerber baby food. What's the Difference Between Annual Plants and Perennials?